If starting from Market Street car park (short stay 3 hours), turn left and then right to walk up Kings Street to cross the main road that runs through the village. Walk left and then take a short cut up Cheapside, to join Stockghyll Lane. From the main car park (4 hours or all day parking), walk right through the village to turn left beyond the Salutation Hotel to join the Lane. Continue up the steep hill and if time does not matter you might wish to go through the gate on the left into Stockghyll Park. Keep to the right hand track and continue ahead until you can see the magnificent falls from the well-fenced viewing platform, approached by several steps on your left. Then return to the path and bear left, as directed, to the wrought-iron turnstile, 2.3m/7ft high, which gives access to the road, where you turn left to go on ascending. If time is short, because of parking, continue up the lane and ignore the walk through the woodland to the falls. Cross the cattle grid and walk out into the open countryside, with ahead, a fine view of Red Screes and a glimpse of the Kirkstone Inn. A short way along, take the signposted steps and kissing gate, on the right, onto 'Open Access land'. Join the pitched path and begin your steady climb. Enjoy the little beck to your left, hurrying downhill under alders. The path climbs on through scattered oak to come to a footbridge over the beck. This is the place to pause and look back down on Ambleside tucked snugly in its hollow, with fine hills all around. Cross the bridge and move out onto the open fell. As the way becomes steeper, pause frequently to enjoy the ever-increasing views, down towards the village. The pitched path continues to a wall and passes through the purpose-built gap. Go on up, more steeply, until you near the spikey top. The now reinforced way winds round left. Look on your right for a little gully up which you may wish to scramble to the summit. Or you may prefer to go on round on the path to the far side of the top. The views from the Pike are spectacular. Far below you stretches the full length of Windermere. Climb the stile over the fence and follow the continuing path ahead as it drifts a little left. Then the way is always down the fellside, occasionally pitched and sometimes muddy. Pass through a gate and turn right to walk beside the wall on pieces of slate to take you over a very boggy area. Some of the 'slate steps' are missing and, if this is too difficult to negotiate, walk on a few steps along the main path and then turn right to find a drier way. You can see ahead clear waymarks directing you across the fell to a wall. Climb this by the stone throughs to the right of the locked gate and then descend the waymarked route over the springy turf. Continue on to the next gate where you should pause to look down on the lovely falls and cascades on Hol Beck. Go through the gate and on along the wide track, the Hundreds 'Road', for 3/4 mile. It descends easily through the pastures. 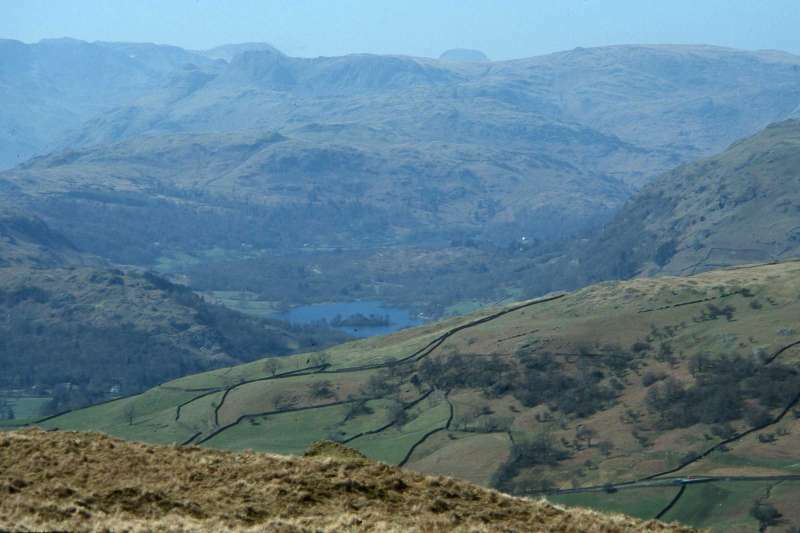 Where the track swings sharp left, go through the kissing gate beside a field gate, on your right, and follow the distinct path, enjoying more fine views of the Lakeland Fells and of Windermere. Go through the next kissing gate and then across a little stream. Stroll on down to ford a shallow tributary of Hol Beck. Follow the good track as it winds round left. Go through two gates to cross a footbridge over Hol Beck. Then bear right to go through another gate and climb gently uphill in the direction of Ambleside. Pass between High Skelgyll and its outbuildings and continue on the high-level track, always with superb views of the lake. Stroll on, with beeches stretching up the fellside to your right, and then the path moves into fine woodland. At the signposted narrow left turn you may wish to visit Jenkin Crag and enjoy more superb views. Then return to the main track and press on. Soon the way winds left and begins to descend, quite steeply. Always choose the widest way to avoid steeper, rougher and slippery mini-paths. Follow the track as it begins to wind right and where the woodland, to your left, ends. The views are dramatically open. Continue on the wide track where it becomes tarmacked and follow it as it winds left and descends to a T-junction, where you turn right to walk the quiet way. Remain on the road until it joins the main road. Walk on a short way, cross the road and then turn left to return to the car park. If you have parked north of the village, carry on past the many interesting shops until you can cross the road to take the footbridge into the main car park. Start/finish: Park in Market Street short stay car park in the centre of Ambleside, grid ref 374045, if you think you will complete the walk in time. Otherwise make use of the main car park at the northern end of the village, grid ref 373046. Terrain: A challenging walk with a steep climb to the Pike and then an easier but longer descent. Pitched paths, reinforced paths, boggy paths, wide good tracks. Refreshments: Wide choice in Ambleside. Toilets: Long stay car park. Foot of Stockghyll Lane.